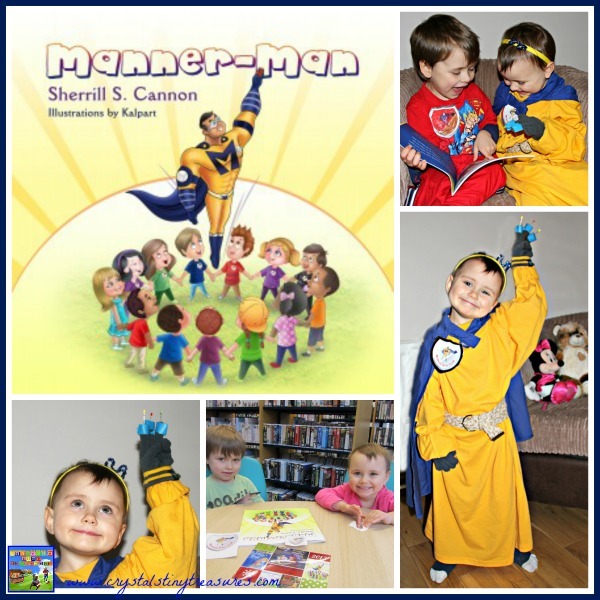 Manner-Man by Sherrill S. Cannon is a fun book for children to help them learn about bullying, their inner strengths, and how to stand up for themselves and others, and of course, manners. It is also the winner of a 2013 Readers Favorite Silver Medal and a Pinnacle Achievement Award. Superheroes are very big in our household, with both Tristan and Kallista flying through the house and around the village with one hand in a fist at the end of an outstretched arm (it looks rough, but it’s the way Superheroes fly) and making whooshing sounds. 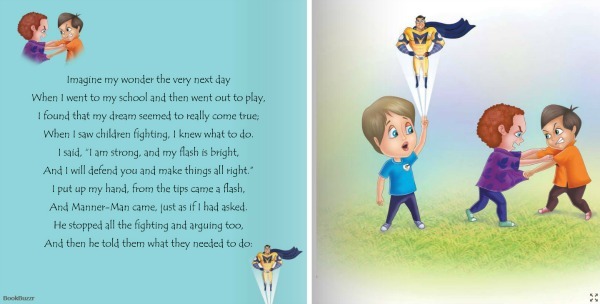 After reviewing Sherrill S. Cannon’s book Santa’s Birthday Gift, she sent us a copy of Manner-Man because she saw Tristan wearing his Superman shirt in the photos of her review and thought he’d like to read a book about a Superhero. This post contains affiliate links for your convenience. Manner-Man is an encouraging story about a boy who has had his toy taken away from him. After a talk with his mother that night he dreamed of Manner-Man, a Superhero that would come to his rescue and help him right wrongs. Rescuing kids from the ones who are mean. Manner-Man helps children find the strength within themselves to to help others and end bullying. It helps them learn to stand up for themselves, and also to be polite. These are difficult lessons for children to learn, but they are very important ones that they will come across for the rest of their lives. The pages are colourful, and the expressions on the children’s faces are so expressive, both when happy and when upset. Kalpart has done an excellent job with the illustrations in this book. After only 2 readings of this book both children were able to finish off most of the rhythmic lines and do the actions as well. Even after just a few times of listening to this book, they were able to grasp the meaning of it. There have even been a time or two that I have begun to quote the book during the day when a gentle reminder about manners is needed. On every page Kallista has me stop reading until she can find each member of our family in the pictures. She has specific ones for each of us now. They may not always have the same hair or skin colour as we do, but she sees the similarities between the children in the book and the people around her. One thing I like about this book is that Sherrill has multicultural characters, which helps reinforce the message of inclusion. Near the end of the book there’s a page that entwines some characters from Sherrill’s previous children’s books, which is beautifully done, and a very cool thing to do! She also has little readers look for some specific things within the book to make it more interactive. Also included is a Manner-Man badge that you can cut out so your child can wear it. There’s also a way to contact Sherrill and she will send you a sticker badge. In fact, we were dressed and about to leave the house to go to the library to make our own Manner-Man badges when Sherrill surprised us again as the daily mail arrived just then and she’d sent the children Manner-Man badge stickers! How coincidental?! We took them with us to the library and had lots of fun cutting silver card for the backing and applying the Manner-Man stickers to the front. A little safety-pin held on the back with some masking tape means that they can use their badges over and over again! We had photocopied the badge at the back of the book a little larger so that we then had a template to use for the backing boards. We didn’t let our copies go to waste, the children coloured them and then they each had two Manner-Man badges. Now they’re really ready to expand their Manner-Man Team! As you can see, we’ve been having some fun around the house with the Manner-Man book! 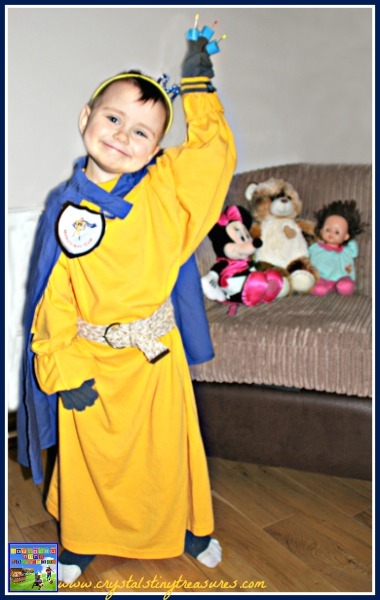 I sent out a quest for help via Facebook to see if anyone nearby had some yellow clothes we could borrow for Tristan. We didn’t have any luck in that department, but a kind soul in the village saw our plea and offered the use of his sweater. We made a few adjustments, cinching it in at Kallista’s waist, making a sparkly ‘M’ from a pipe cleaner and attaching it to a hair band, borrowing Tristan’s gloves, and using a cape that my Mom made for the kids. 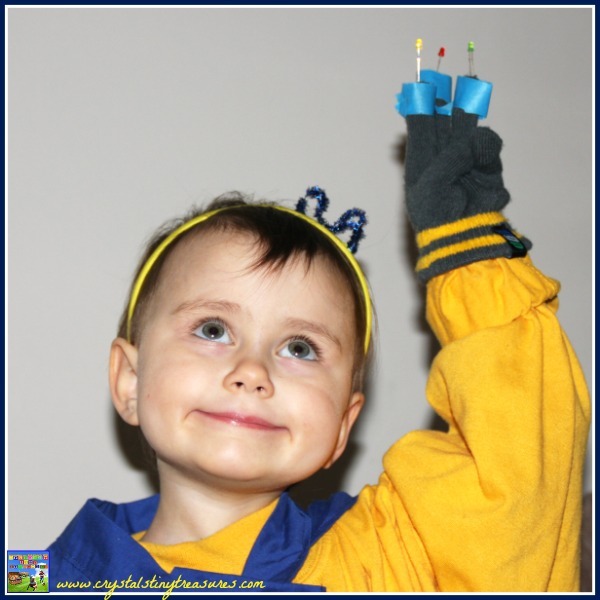 We even snuck in a little science lesson about simple circuits when we made Kallista some lights for her fingers from a science kit my sister sent over last year! Of course, the outfit wouldn’t be complete without a Manner-Man badge! I would definitely recommend this book to others, and it would work especially well in a school or daycare setting where there are many children around and sharing and kindness is a must and bullying is something to be discouraged. This book is all about being kind, polite, and making everyone feel included. If you’d like to see a little more about this, and other books Sherrill has written (Gimme-Jimmy, The Magic Word, and Peter and the Whimper-Whineys, Santa’s Birthday Gift), she has some sample pages available to read on Freado. “I love the music of words, and I try to help children hear that music…” If you like what you see, you can find out more about Sherrill on her webpage, follow her on Facebook, or learn more about raising money for the JM Foundation. Sherrill is also having a new book released early this year, so keep your eyes open for a release date! What a great review of Manner Man! Your pictures are really sweet. It looks like this life-lesson will be long remembered by your children. Joining you from the Kid-Lit Blog Hop. This book sounds wonderful, I’ll have to keep an eye out for it. Please do, it really is a great one! I love books that teach kids to be kind and to use good manners. I’ll have to check her book out! Thanks so much for linking up to the Kid Lit Blog Hop!! Love finding new resources for teaching manners! Thanks for sharing at After School! I think we could use a little Manner Man at our house some days! This is such a clever way to teach children. Thanks for sharing at the After School Link Up. It’s a fun way to sneak in some learning, and a gentle way to remind them to use manners. Enjoy! Manner Man sounds like a good book for kids. I love that each book has a lesson! All of Sherrill’s books are great, we’ve just read another of hers this week, watch this space for more information about it in the future. I hadn’t heard of Manner Man. What a great concept. Thanks for sharing!!! Omigosh!!! Your kids are soooo adorable!! I love the Manner-Man costume you put together – it turned out really great and I love the lights at the fingertips – nice touch! 😉 Thanks so much for joining us in the Kid Lit Blog Hop. I am very sure that you have chosen the right track of education for your son. The book sounds very interesting and your son really enjoy it. Thank you for sharing. Thank you, Adelien, that means a lot coming from another home educator 🙂 Thanks so much for taking the time to read and comment, have a great week! This is the second time I’ve come across this book and I really want to read it!! Thanks for sharing this at Booknificent Thursday! Always great to have you! It’s awesome, even on the 20th reading, and you can’t say that about too many books these days 😉 I hope we’ll see you again soon! Those are some Super Cute photos! Thanks for joining us at the KLBH. I’m extremely late in my hopping this time. Forgive me, and see you again in the Linky next week! 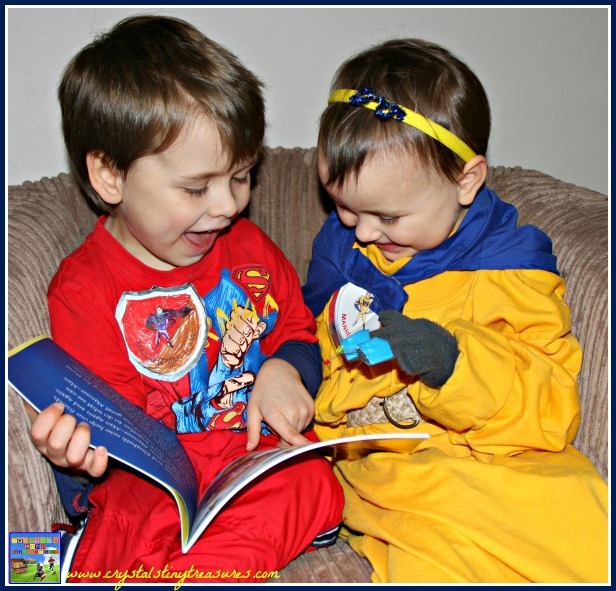 The book looks fun, the kids look hilarious!It is such a great way to teach children manners! Thank you for sharing it with us at Kid Lit Blog Hop! Teaching things in fun ways is often preferable to repeated lectures 🙂 So it’s great to have the resources to do it!